1. Wash the 3 dals and rice thoroughly, and soak for 2-3 hours, along with the red chillies. 2. Grind coarsely in a blender. 3. Add chopped onions and coriander leaves, to the batter. Add adafoetida and salt and mix the batter well. 4. Pour out a thin dosai on a tawa, Pour a teaspoon of oil round the sides, and cover with a lid. Turn the Adai over and brown the other side. 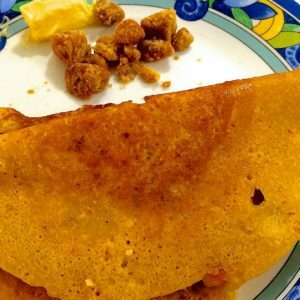 Feel free to comment or share your thoughts on this Adai Recipe from Awesome Cuisine.